This is a bit different from the norm but it's not too far off base because I work a lot with color as a makeup artist. And color theory has played a huge role in my life as a creative artist. As a artist with a background in Interior Design I had a opportunity to take Psychology and I remember when we did a project and my topic was on ADHD and how color can effect someone that was diagnose with ADHD. As an Interior Designer this is important to know because if I ever decided to work in the medical field or in the Interior Design industry COLOR THEORY is important and the psychology of how color can effect the mood and and our thoughts is EXTREMELY important. What I learned while doing this research is there are colors and shades that can trigger a personality, mood and your thought process. Color can play a huge role in how we react and can bring out a personality. I was inspired to write this after joining a group on facebook and one of the members posted on the wall about her being an overthinker when it comes to writing blogs daily. And she asked does anyone else overthink every single blog post they write? My response was no mainly because I guess as a beauty blogger and someone that works in the industry my inspiration is in beauty so it makes it a bit easier in my case to write freely and it flows to me. Many times when I'm writing I'm writing in my room in my bed. I'm relaxed and then my walls are blue. But sometimes I switch up my environment BUT I'm not an overthinker in that way UNLESS it was on a topic that I'm not familiar with. However I am an artist and as an artist I like to switch it up. I don't follow a routine like that because FOR ME that's boring and it doesn't inspire me. But there are some that require a bit more structure which is fine. You know yourself and how you work so DO YOU and STAY TRUE to who you are. However if you're an overthinker and know that then sometimes changing your environment can help one that is considered "AN OVERTHINKER" which I feel is a blessing and a curse all at the same time. As a visual person color, the scent, the environment and the sound effects my mood and how I process my thoughts. I don't like a bunch of LOUD music but I do love something a bit more upbeat to keep me TURNT UP (lol). I love KINETIC energy (FIRE). It's something about the flicker of fire that keeps you going and it triggers the mind while relaxing. I love the sound of water running, more like a water feature and the scent of either peppermint or lavender. Sometimes I like to sit in front of a window and write. It all depends. There are colors you would never see me near while writing blogs. I can be a bit hyper at times and sometimes I can't think because my mind is going 100 miles per hour. Although white represents, purity, cleanliness, innocence, newness, freshness. These are all great however white is definitely a minimal, cold shade. It's TOTALLY UN-INSPIRING for me! You would NEVER EVER see any of my walls "WHITE". They may be off white or beige but never white. UNLESS I dress the white up. Accessories can make a HUGE difference but I'm really not a fan of white. I won't say no to the shade. It all depends on the space. Black represents darkness, death, the unknown (depending on how you look at that, that can be a scary thing), mystery. But it also represents protection other words (hidden in the shadow. )Which could be good depending on how you look at it. As far as your environment is concerned it's all on how you set up the space. Black can look very elegant and edgy in a space. Black can also make a space look smaller. I'm claustrophobic so anything that makes the wall look like it's overtaking me is a no go for me and quite UN-INSPIRING UNless you have a VERY large space and you want to make the room a bit more welcoming then having possibly an accent black wall is not bad. Beige can be elegant, conservative, it's a safe shade that can go with any shade of contrast, it's a dependable neutral color. It can bring a space together but alone it can be very boring and uninspiring. But just like black it's all on how you dress it up. You can liven up a bland shade with colorful accessories. But this color alone will not make it in my book. Brown is an earthtone friendly shade. I always feel you can never go wrong with brown. It's a safe conservative shade. HOWEVER for myself I love brown as accents but not as the main color. I love gray as a blank canvas. Gray is just a reliable shade. It's inbetween and anything against gray just looks THEBOMB.COM It's conservative but it can also come off as a gloomy shade and alone can make you sad and depress. With any neutral shade you have to liven it up. RED I just don't like that color for a room PERIOD! Maybe an accent color but too much red can make you dizzy and to me it raises my blood pressure lol. Great for a bedroom with your husband lol But not for someone who is writing a blog post. NOPE! Yellow is an inspiring color also but it tends to make my eyes jump and makes me quite unstable. It's not exactly the most inspiring color to work in but it does evoke excitement it brings energy and it's definitely a creative color. YES I am a creative person however my ADHD personality does not mix well with yellow. I am way too hyper and many times can lose focus in vibrant rooms when working. My bathroom is pale yellow. So if I need to wake myself up a bit I'll go in the bathroom and just sit in there for a LITTLE while, it raises my excitement level and once I'm a bit overwhelmed of being in a yellow room which doesn't take long I'll go back to my inspiring cyanish blue room. I ABSOLUTELY love orange as a accent color on a wall. It's quite inspiring. Of course when I think of orange I think of citrus and the effect you get when smelling the scent of citrus acid. It's an amazing feeling. It get's you started on your day. Orange makes me smile, I tend to have a lot more confidence. It's a successful shade. I love it in combination with a bluish teal or cyan shade. GREAT Contrast and the combination together for a space is a great mix for someone that is a bit creative but need that balance of peace and serenity. I've grown to love pink but more like an accent color. Too much pink makes me sick. I hate pink on walls! I think pink has its place and should be used wisely because too much pink can come off frilly. I am a woman but I don't like things to look too feminine. But it is definitely known to be a happy, healthy, compassionate and playful shade but. It's not personally my fav for a wall color but for accents yea I love hints of fuchsia pinks and different shades of pinks. Gold represents, wealth prosperity, It shows value but it also represents greed. It shows that you're a dreamer and possibly love quality things. So if I ever decided to paint my wall gold I would only do an accent of gold vs. painting every wall space gold. Because it can come off the wrong way and I believe in the saying "less is more". When used as an accent it's believable and it doesn't come off as cheap. Depending on how paired it could be a place to feel like you on top of the world and you're in a luxury spot. And it could be inspiring. I don't know if I could be in a gold accented room all day if I was working but for luxury and to possibly read, sit back and relax maybe so. Blue is a neutral shade that you see mostly in learning environments, offices and many corporate environments. It's definitely not an offensive shade. It's a color that represents intelligence, it represents loyalty and love. It's calming but can also come off as cold and dull. But with the knowledge of color theory a perfect blend could help balance out a space. I personally wouldn't use a regular blue shade for a wall space got me. Green represents grown, prosperity, fertility, freshness, healing and more. It has it's negatives but for a space I think green with a blend of blue is a great shade. I would paint each wall green. I think certain shades work better as accents vs being the main color depending on which shade of green you're using. Because green is a cool color if I ever used that color in a space I would have to add a blend of warm accents just to add some balance because too much of any color can be bad. Well at least for me. Some people can be in a one color space all day every day. HEY DO YOU! OMG I LOVE Purple! Especially for a space. It's also a calming shade, it's a shade that represents ambition, royalty, spirituality, luxury. I think a lavender shade is a gorgeous shade for a space. it's not too overbearing and it works cohesively with many shades vs a deep purple. 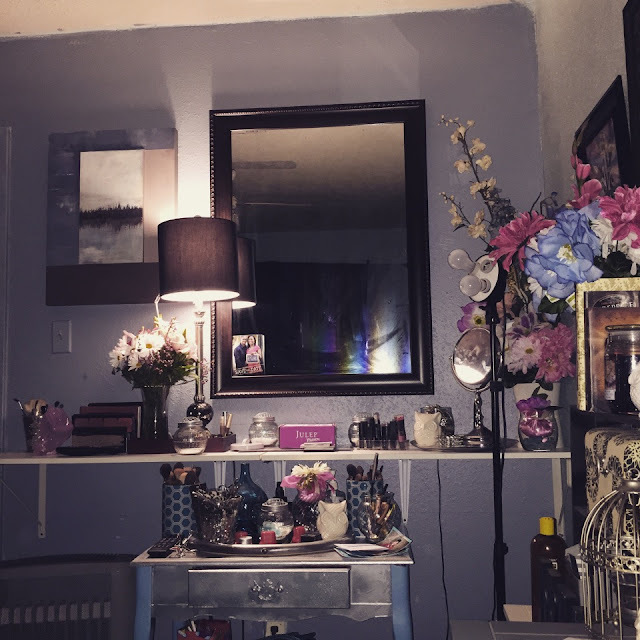 I hope to paint my space a lavender purple one day. I think these shades are vibrant cool shades representing spirituality, I've always associated this shade with water, just refreshing. It's a sophisticated shade and I can actually see myself working in a turquoisy/tealish space. I mean I can visually see it and how I would decorate the space. It's definitely in my opinion an inspiring shade and depending how done it could come off looking FABULOUS but if paired wrong it could look cheap and underwhelming. Silver can be seen as a glamorous shade, futuristic, hightech sleek shade. I personally would only use silver as an accent. Too much silver could be too much unless you're into that modernistic look or HIGH GLAMOROUS life. I'm just not. I don't need everything to sparkle. It throws me off balance. Based on image above color plays a huge role in how we react and can effect our overall all decisions. Also what I love is FLOWERS! Even if they're not real just seeing flowers brightens up my day. 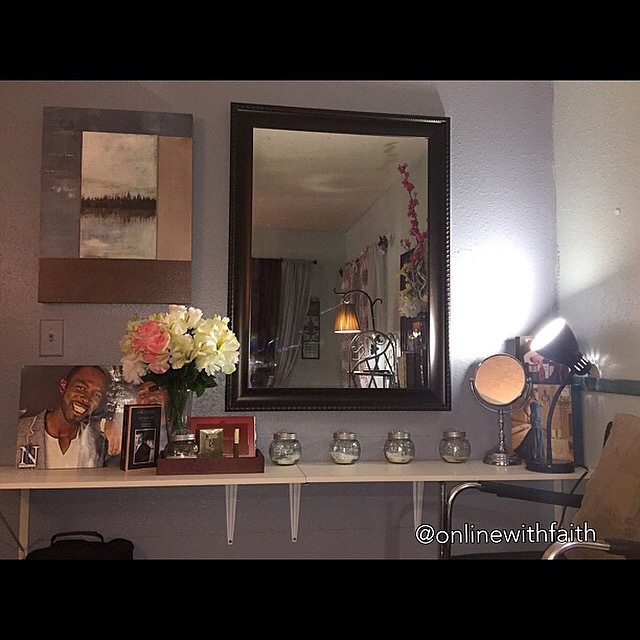 It adds texture, it brings life to a space and adds a burst of color into the space. Here is a photo of my space. I like to work near makeup because it just inspires me as a beauty blogger. I make these flowers myself. 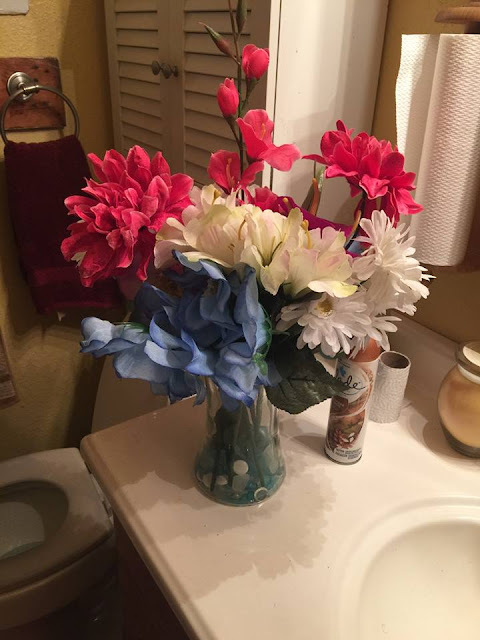 I recycle vases but you can go to the 99 cents store and purchase vases and artificial flowers for $1 or less. What are your favorite colors???? I would like to add you don't always have to paint your walls or totally dec out your space sometimes a change of environments triggers and stimulates the mind. SWITCH IT UP!